#6 "คุณเชื่อป่ะ “ว่าคนเราจะชอบกันได้โดยที่ไม่เคยเจอหน้า?” [Part 1]"
#8 "VRZO - จินนี่จ๋า [by LAZADA]"
#9 "ท่องเที่ยววิถีไทย เก๋ไก๋ไม่เหมือนใคร (Discover Thainess) - version 2 นาที"
This week Google Thailand released its YouTube Ads Leaderboard for the first quarter of the year - a highly anticipated list that represents the top ten ads on YouTube that Thais chose to watch and share. YouTube officially launched in Thailand last May and in a matter of months, Thai advertisers were securing a place in the top ten most watched YouTube Ads of 2014 for the whole of Asia (Thai Life’s “Unsung Heroes”). Thai Life continued their success into 2015, topping the Q1 2015 leaderboard with “The Reason” - a thought provoking 4+ minute mini-movie that explores the Royal Anthem by asking Thais to think about why they stand, sing, and revere the King. 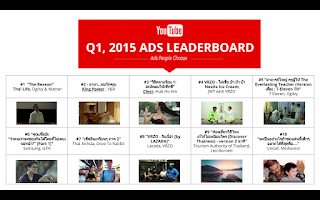 The Thai Life ad is great at stirring up emotions and has generated over 3 million views worldwide as a result, but Thai Life is not the only brand in the leaderboard connecting with a large audience. Thai advertisers understand that YouTube enables them to go beyond the constraints of a 30 or 60 second traditional TV spot, and tells stories, creating made-for-YouTube content and deepening their engagement with a highly-connected, active audience. Authentically Thai: The most striking thing about this leaderboard is how “Thai” the ads are, from Thai Life’s ad, exploring the national anthem, to 7Eleven’s tale of an inspirational teacher, to the Tourism Authority of Thailand’s ‘discover Thai-ness’ campaign, Pakorn Chatborirak and Nichari Chokprajakcha watery adventure right down to the prank self check-in machine at the airport courtesy of AirAsia — Thai audiences clearly respond well to stories that they can directly relate to. YouTuber Star Power: What better way for brands to engage with their YouTube audience than by using “the experts” — successful YouTube Creators — who understand the passionate fan community and are helping brands be part of the conversation. Both Nestle and Lazada harnessed the creativity of popular local YouTube creator, VRZO, and their message is a great combination of fun, functionality and YouTube celebrity with genies that grant online shopping wishes to green tea ice cream that gives the authentic taste without the traditional, time consuming preparation. Made-for-digital: The majority of leaderboard ads are made-for-digital, with formats created specifically with YouTube’s audience in mind. Eight out of ten of these YouTube ads are well beyond 30 seconds, in fact the average length is four minutes - twice the average across Asia-Pacific in 2014. YouTube offers creative freedom for brands, who can create videos of any length they choose — at a fraction of the cost of other mediums. Laugh, cry, fall in love with emotional, dramatic stories: Thais chose to watch and share all of the ads on this leaderboard. The reason is simple: great storytelling. Many of these ads feel more like short films than ads, but even more than high production values it’s the emotions that the ads stir up that makes them powerful — such as in Unicef’s video ad, where we see witness a very touching moment between children and their fathers — that show Thai brands know the way to earn love is through the heart. YouTube secara resmi diluncurkan di Thailand pada Mei tahun lalu. Dan hanya dalam beberapa bulan Perusahaan Thailand dapat diperingkatkan dalam 10 besar iklan YouTube yang paling banyak ditonton di Asia.